It’s a big week in America and while the NBA action pauses for Thanksgiving, there is absolutely no let up over the course of the week. You’ll find that the days surrounding the big American holiday are busier than usual in the NBA schedule so if you can plan ahead, you are in for a treat of NBA action this week. The NBA schedule isn’t the easiest for UK and European basketball fans but there are enough special moments to look out for if you can stay up late. By the close of Sunday evening, only three teams had managed to break into double figures for wins. The Golden State Warriors are out on their own with a 15-0 record, making them the team that everyone wants to beat, but the other two teams who have reached double digits are in action in the early hours of Tuesday morning for UK and European basketball fans. Both the Cleveland Cavaliers and the San Antonio Spurs are 10-3 for the season so far and they both have home games in the NBA schedule at the start of the week where they should be confident of continuing their winning run. You can find the Cavs at -9, at odds of 1.90, to overcome the Magic and the Spurs are listed at -8.5, at odds of 1.95, to defeat the Suns. These will inevitably be the games that people are drawn to but taking the Detroit Pistons at -2, with odds of 1.90, against the Bucks could be a good additional basketball bet for you to take on at the start of this week. The Lakers are 2-11 for this season while the Warriors are 15-0 so it would be the shock of the season, and possibly the decade, if the Lakers were to overcome the all-powerful Warriors in their home. Clearly the Warriors will lose games at some point and on any given night, any team can lose to another but this is unlikely to be a game where there is going to be value for any basketball betting fans. The Celtics in Atlanta and the Bulls trip to Portland are likely to be much closer affairs and whether you are looking for attractive odds or exciting match-ups, they could be the games in the NBA schedule for basketball fans to watch out for in the early hours of the morning in the UK and Europe. In the UK and Europe, we may have rolled into the early hours of Thursday the 26th of November, the day that America celebrates as Thanksgiving but in the US, it is still Wednesday night and there is a raft of games to look forward to in the NBA. 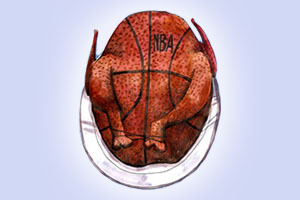 This is because the NBA teams get to celebrate Thanksgiving with a day off (the NFL is seen as the traditional American sport on Thanksgiving Day), so if you are planning one late night this week, definitely make sure you are turned in late Wednesday evening, early Thursday morning. After the break on Friday morning for European and UK NBA fans, the NBA schedule resumes on Saturday morning and there are more than enough games to get your weekend started in the most appropriate manner. When it comes to watching NBA games at a reasonable hour, Sunday night is the night for basketball fans in the UK and Europe. UK fans can enjoy the Hornets welcoming the Bucks at 7pm, the Clippers play host to the Timberwolves at 8.30pm in the UK and then there is a raft of games to end the week on a high. If you don’t have to be up early on Monday morning, you have 4 games to round off the week in style. If you fancy extending your weekend a little bit more, you’ll find two NBA games waiting for you in the early hours of Monday morning. The two home teams are at the lower end of the standings so there could be some fun in store for the away teams or it could be a chance for some long-suffering fans to finally get a reward!